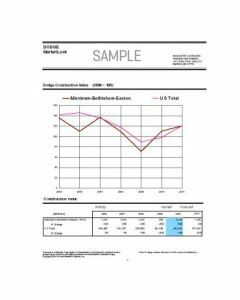 The Metropolitan Construction Insight provides construction forecasts and an analysis of trends in residential and nonresidential construction for the 36 of the largest U.S. metropolitan areas, presented in a highly visual and graphic PDF platform. Information is presented for 7 major nonresidential building types and 2 residential building types. 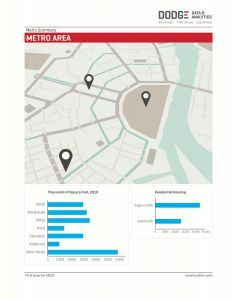 MarketLook provides a one-year outlook for short-term planning as well as construction starts in terms of square feet and dollar value for 22 major project types covering nonresidential, residential, and nonbuilding (engineering) construction. Reports are available for by states and metropolitan areas. The Dodge Construction Outlook is a synopsis of the conditions affecting the US construction industry and a forecast for the upcoming year by project types and 5 regions. The Outlook is released each fall, with a midyear update released the following summer with updated projections.